Some questions are commonly asked recently, so here’s an update answering to it. Is SteadXP@ compatible with GoPro® Hero 5*? The Hero 5 is not compatible because it doesn’t have anymore the connections to plug the SteadXP@ (originally designed to plug an add-on screen or battery) on its back. Another one is coming soon, more accurate to demonstration. It exists plenty of stabilization softwares. Some are basics, not so expansive or even included with a video editing software. But the rendering would be just as basic. For a better quality it would cost much more. And they can’t correct the rolling shutter. The handheld gimbals are really efficient. But for those, let’s call them ‘the adventurers’, in quest of the slightest weight loss and space gain, this system isn’t so appropriate. 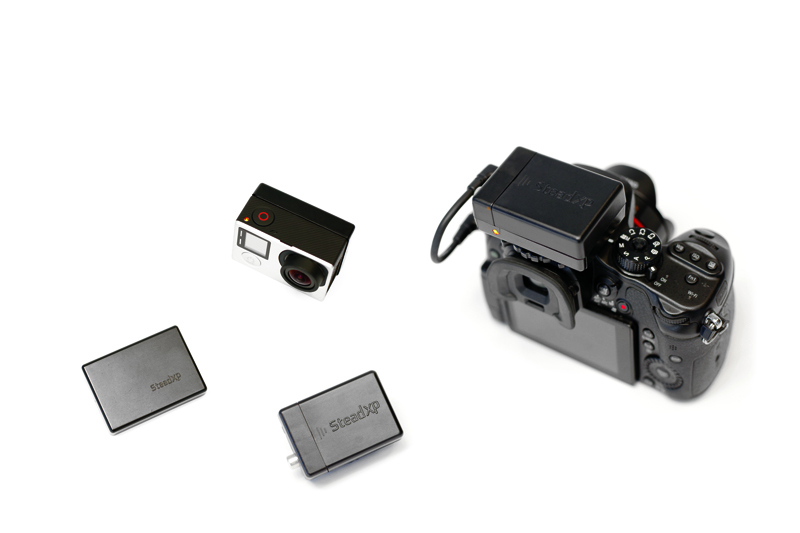 Whereas the small SteadXP box, light and rugged can be plugged on a GoPro®* or a DSLR/Mirrorless with 1second setup time. The videographers would enjoy full freedom of movement even allowing them some impossible shots (underwater with SteadXP@ for example). The rendering would be more efficient due to the motion data recorded during the shooting, used by our algorithms to stabilize the footage. In short, our technologies is still the game changer you backed a year ago, towards other stabilizers, in terms of ease of use and price-quality ratio. I chose the 6 weeks reward, when will I be delivered? The delivery will respect the plan order of priority. You’ll in fact receive your product six weeks before the other backers. After that will follow the shipping for those who bought a SteadXP from our pre-sales on the website. During that period you’ll be able to tell us your feedbacks on our software, to help our developers to improve it. I’m moving, how can I update my shipping address? You can update it by connecting on your private account. BTW, some of you didn’t ever give any shipping address. So I would advise all of you to check your private account if there is a valid one. It will prevent us some last minute delivery inconveniences. As I am the new one here, I would like to conclude that I’m here because I’m convinced by SteadXP technologies as much as all of you were here when you backed the project. And that’s why I’m determined to do my best, to remind the trust of those who lost it. Not a big deal haha. I know it’s a lot but I would ask you to please keep believing in SteadXP just a little bit longer. The products are in the starting-block to be delivered. Get ready !